These are decadent. They aren’t for everyday, but maybe for a special brunch. Or how about a Valentine’s Day party? Bring these into work on V-Day and be the cupid of the office! 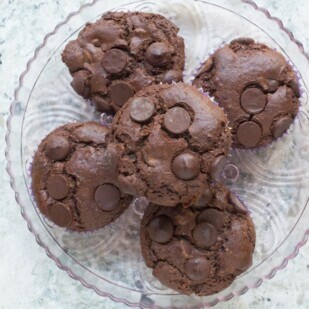 Or, I can tell you that these Low FODMAP Double Chocolate Chip Muffins ALWAYS sell out at a Bake Sale. Guaranteed. They are rich, moist, easy to make and very chocolatey – yet low FODMAP. Just be sure to stick with the serving sizes. 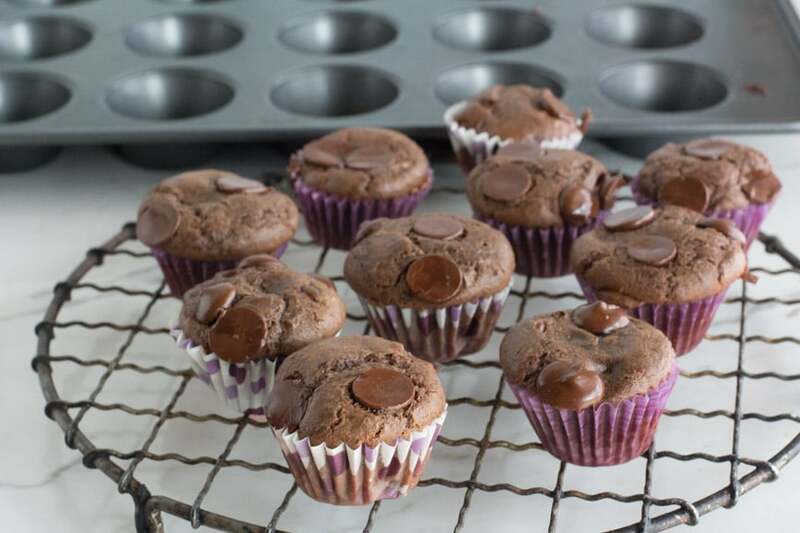 I have given you instructions to make these Double Chocolate Chip Muffins in a standard muffin size, as well as mini size, making this recipe quite versatile. These are the mini size. You can eat TWO! We use dark colored, heavyweight, nonstick muffin pans in the Test Kitchen and feel they give the best results. 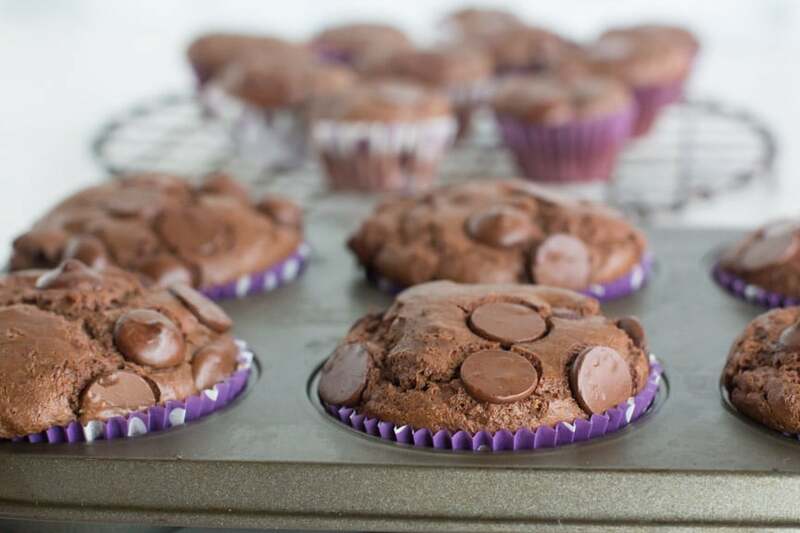 You can bake either size in paper fluted paper cups – or leave them naked! If going with the latter approach, make sure to coat the inside and the tops of the pans very well with nonstick spray. Check out the mini size in the background. We have a fabulous article called All About Cocoa, which I encourage you to read. This recipe calls for natural cocoa. Please make sure to sift it before measuring. Dark chocolate is low FODMAP in small amounts and this recipe is within low FODMAP limits. Read our article about dark chocolate to learn more. The instant espresso powder adds a depth and richness of flavor; you won’t necessarily taste coffee, though. 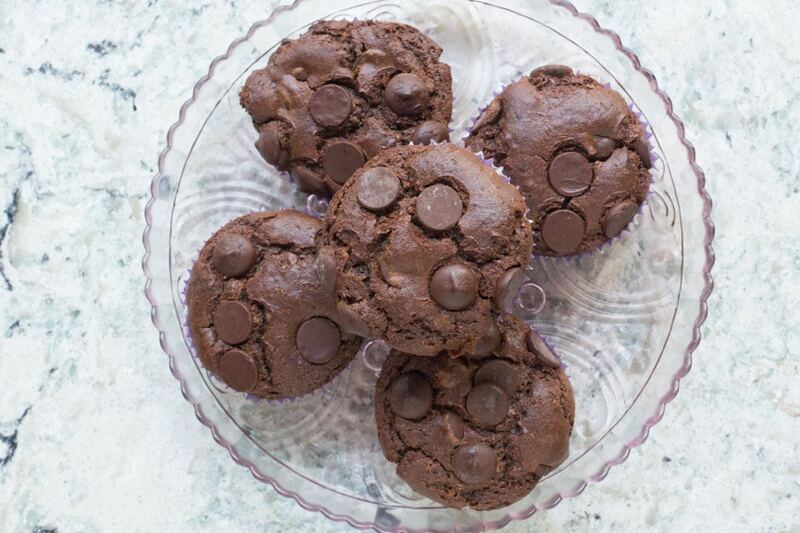 These Low FODMAP Double Chocolate Chip Muffins are CHOCOLATE through and through. I know, this is an odd number. No matter what I did, I couldn’t get this recipe to be 12 or 18. Sorry about that! 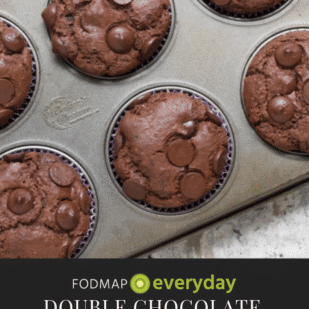 These Low FODMAP Double Chocolate Chip Muffins are rich and decadent! Make sure to watch your serving sizes. Position rack in center of oven. Preheat oven to 375°F/190°C. Coat the tops and insides of 15 standard muffin cups or about 40 mini muffin cups with nonstick spray. Alternatively, line with fluted paper muffin liners. In a large mixing bowl whisk together the flour, sugar, cocoa, baking soda, espresso powder and salt to aerate and combine. Whisk in about three-quarters of the chocolate chips; set aside. In a separate bowl, whisk together the yogurt, milk, oil, egg and vanilla until combined and smooth. Pour this liquid mixture over the dry mixture and stir and whisk until batter is just blended. 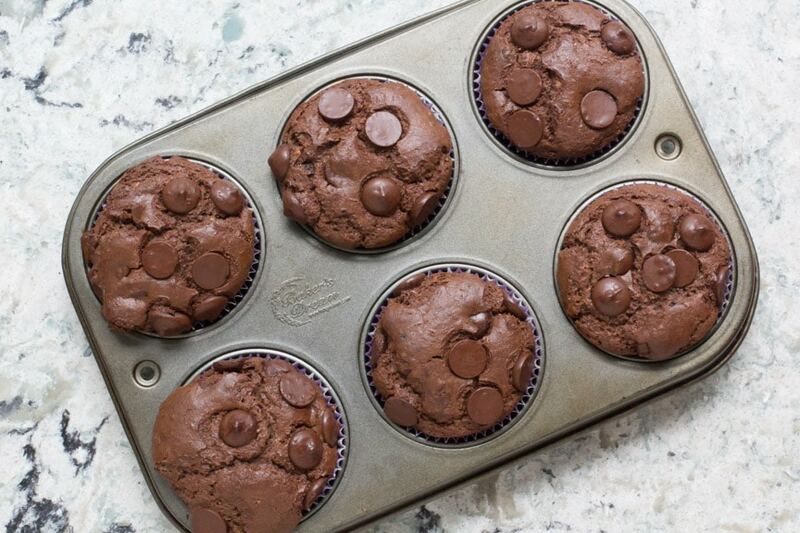 Fill prepared muffin pans about three-quarters of the way full and top each muffin with a few chocolate chips. Bake for about 20 to 25 minutes for standard sized muffins and about 15 to 18 minutes for the minis. In either case a toothpick inserted into the center should come out with a few crumbs clinging. Cool pans on racks for 10 minutes, then unmold muffins onto racks to cool completely. Muffins can be stored at room temperature in an airtight container for up to 3 days.